Studied the harp with Ann Hughes-Chamberlain, the highly respected harpist and former pupil of the legendary Lily Laskine. Over twenty years experience of playing at a varied range of venues and events. 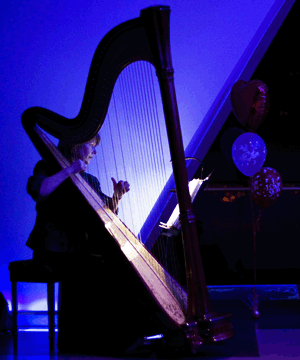 Performed at music festivals, and became well-known for ten years of solo harp recitals at Guildford Music Festival. Composed and recorded incidental harp music for regional films. Performed and been interviewed on BBC Southern Radio. 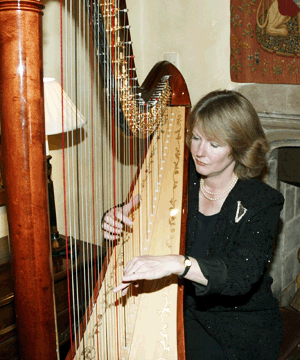 Teaches the harp privately and at Hindhead Music Centre, of which Ann Hughes-Chamberlain is the Principal. Tutored some successful harp workshops and residential harp weekends for the Clarsach Society, schools and music festivals in Sussex and Surrey. In 2001 Sally released a successful solo CD of Traditional harp music, entitled "A Celtic Miscellany". NATO's Chiefs of Defence Staff, Duke and Duchess of Richmond, Lord and Lady March, Sir Cliff Richard, Virginia Bottomley, Anthea Turner, Ronnie Corbett, Anthony Andrews.